Kal Dosa with Ulavala charu is a die for combination. Ulavala Charu is prepared from Ulaval or Horse Gram. Ulaval Charu is what Amma makes during Shivarathri and few other Festival season. When I was a kid, I used to eat this with Jaggary. Amma used to specially grind the ulaval with jaggary in the rubburai (the stone used for grinding food) The taste that comes out is heavenly. I remember many ardent days spent eating this. She makes Ulaval Belam Mudda, which is made by grinding Cooked Horse Gram with jaggary without adding water. It forms a mass which very sweet and God, thinking about it makes me want to get back to those lovely days. I wish I indulge my kids the same way with these wonderful dishes. Alas, I don't have a grinding stone nor think they might enjoy them at this age. Charu is made from the water that's drained after boiling the Horse Gram.Amma at times makes this some hours before, because that's how it tastes best. Mostly she makes the charu in the previous night and lets it soak. She mostly serves this with Kal dosa for breakfast the next day. Thinking of Kal dosa, reminds me of Dad. He is so fond of Kal Dosa. Amma always takes extra special care with serving food for Dad. She makes sure she makes the dosa for Dad, even if I was making for others. Its not just Dad, who loves Kal Dosa, but all of us too. Though hubby dear does not like this with Ulaval Charu. I just love the combi. 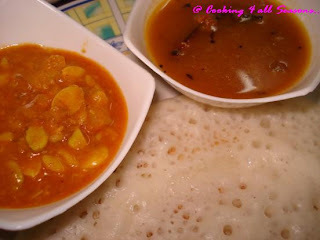 Kal Dosa is something that gets cooked only on one side. After pouring the batter on to the tawa, a hood is placed over it, to obtain the steaming effect and which in turn will have holes formed on the top. I came to know that in olden days, these dosas were made with very little oil, mainly for taking as a packed snack for journeys. 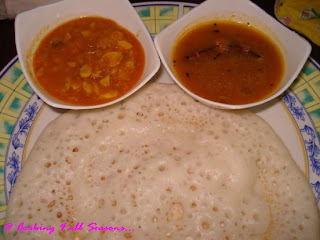 Kal dosa is also soft and plumper. 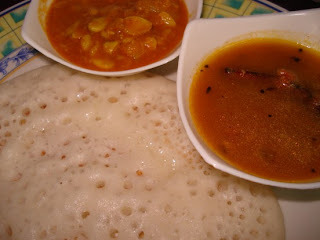 Amma even otherwise, makes soft dosas for side dishes like Ulaval Charu or Pithiki Pappu Kura. In my Pithiki Pappu Kura, many wanted to know how it looks. So here's a picture of the process. The other day, as this pappu is in season now, we have been having this often for breakfast. Athamma had prepared Ulaval Charu the previous night and I was feeling bad that I couldn't take a shot of it. So we made it again the next day. Having it after so many years reminded me of my many wonderful memories associated with that as a kid. I long for that Ulaval Belam Mudda. Wish I will get around doing that again. Clean and soak the rice as you do for regular Dosa batter. Grind to smooth paste and let it ferment overnight or minimum 6 to 8 hrs. Heat the tawa and grease oil over it. Pour a ladleful of batter and spread it as you do the usual way, but take care not to spread too thin one. Sprinkle little oil and cover with a lid. Put it to medium and cook for 1 -2 mins. Remove the lid, to see if all the parts are cooked. You should not turn over. Nice holes will be formed on the top and the dosa will be really soft. 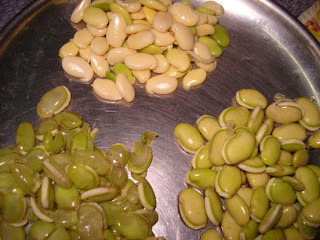 Ulaval Charu or Horse Gram Charu. It was funny seeing charu being mentioned as soup. I guess for want of a better word, this was associated. Anyway, this is a lovely recipe which is Amma's signature one. This has always tasted the same whenever I tasted. Of course, the taste of this comes with age. Soak Horse Gram for min 6 hrs. Pressure cook it for 5 - 6 whistles. Once the pressure is down, cook on direct flame for more juice to get into the water. Drain the water from the horse gram. We use just the water and about a tsp of cooked gram in the charu. The boiled horse gram is either eaten with jaggary or seasoned. In bowl, take the tamarind, the ground paste and add required water with salt. Mix well. The amount of water depends on how much charu you want. Heat a pan with 1 tsp oil. Add mustard seeds, Urud dal and curry leaves. Once it splutters, add the chopped onions. Sauté well till its brown. Then add the mixed liquid and bring to boil. Cook for 5 mins and remove. Rest of the cooked Ulaval can be seasoned and eaten or can be ground with Jaggary and enjoyed. Enjoy this Andhra Specialty with Tamilian one! There is this incident that happened last evening. I have been wondering on plagiarism and stuff. I had seen few sites use my content, but I never bothered on that before, but something made me change my feed to short. I was pleasantly surprised to get a comment from a reader who had felt sad that I changed to short feed, which makes it difficult for them to read.. I hadn't really thought much on this when I was changing it. So on seeing that comment, I promptly changed it back to full feed. Yes there is this issue with plagiarism. I wish people take proper note on this and not just copy what is not theirs. But give proper credit to the source. At the same time, I don't want my readers to suffer. After all, I get headed and this is going on the encouragement that I get from all. What I publish is publicly accessible, so how they reach it doesn't matter. Still I feel it will be good to receive feedback on what I write. I was very happy to get that note though. Thank you!